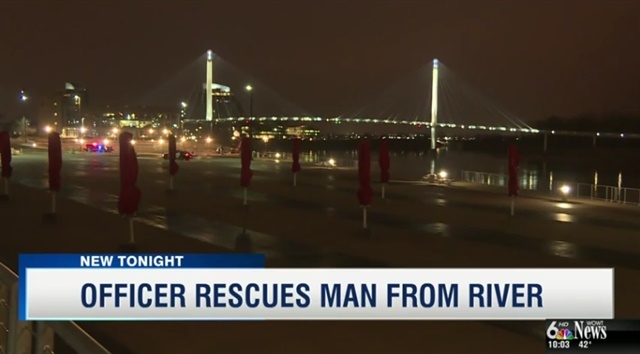 An Omaha, NE, police officer made a heroic rescue to save a man in the Missouri River Monday. The incident began when witnesses said the unidentified man jumped off the Bob Kerrey Pedestrian Bridge Monday evening. Witnesses called 911 after they heard the man calling for help from the river. An officer risked his own life and jumped into the frigid river when he spotted the man struggling in the water. After several minutes in the water together, the officer was able to pull the man to safety. Officials on scene said the man was toweled off and taken for a mental evaluation. The officer is being evaluated, but is expected to be OK.